Microsoft is gladly partnering with Code.org to support their mission to introduce tens of millions of students all over the globe to the world of computer science and coding. Through simple tutorials students, young and old, can find out how fun coding can be in as little as an hour. 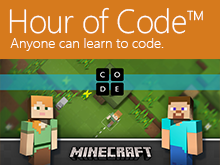 The Hour of Code has dozens of tutorials meeting all levels of ability, and Microsoft continues to provide engaging coding puzzles into Code.org’s library. Check them out today and introduce students around you to the world of code.